It’s taken 24 centuries, the work of archaeologists, scholars and historians, and the advent of the Internet to make the Dead Sea Scrolls accessible to anyone in the world. Today, on the eve of the new year on the Hebrew calendar, we’re celebrating the launch of the Dead Sea Scrolls online; a project of The Israel Museum, Jerusalem powered by Google technology. Written between the third and first centuries BCE, the Dead Sea Scrolls include the oldest known biblical manuscripts in existence. In 68 BCE, they were hidden in 11 caves in the Judean desert on the shores of the Dead Sea to protect them from the approaching Roman armies. They weren’t discovered again until 1947, when a Bedouin shepherd threw a rock in a cave and realized something was inside. Since 1965, the scrolls have been on exhibit at the Shrine of the Book at The Israel Museum, Jerusalem. Among other topics, the scrolls offer critical insights into life and religion in ancient Jerusalem, including the birth of Christianity. 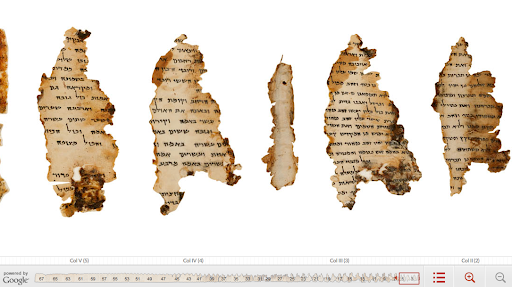 Now, anyone around the world can view, read and interact with five digitized Dead Sea Scrolls. The high resolution photographs, taken by Ardon Bar-Hama, are up to 1,200 megapixels, almost 200 times more than the average consumer camera, so viewers can see even the most minute details in the parchment. For example, zoom in on the Temple Scroll to get a feel for the animal skin it's written on—only one-tenth of a millimeter thick. You can browse the Great Isaiah Scroll, the most well known scroll and the one that can be found in most home bibles, by chapter and verse. You can also click directly on the Hebrew text and get an English translation. While you’re there, leave a comment for others to see. The scroll text is also discoverable via web search. If you search for phrases from the scrolls, a link to that text within the scroll viewers on the Dead Sea Scrolls collections site may surface in your search results. 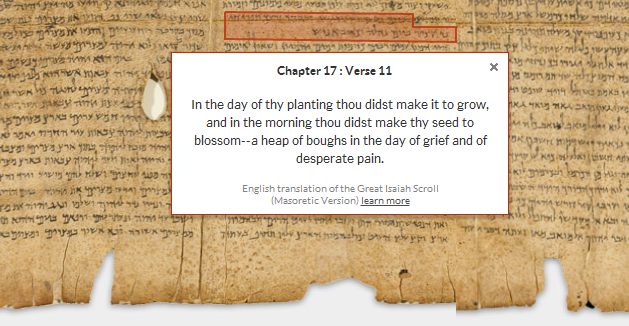 For example, search for [Dead Sea Scrolls "In the day of thy planting thou didst make it to grow"], and you may see a link to Chapter 17:Verse 11 within the Great Isaiah Scroll. This partnership with The Israel Museum, Jerusalem is part of our larger effort to bring important cultural and historical collections online. We are thrilled to have been able to help this project through hosting on Google Storage and App Engine, helping design the web experience and making it searchable and accessible to the world. We’ve been involved in similar projects in the past, including building the Yad Vashem Holocaust photo collection. We encourage organizations interested in partnering with us in our archiving efforts to enter their information in this form. We hope you enjoy visiting the Dead Sea Scrolls collection online, or any of these other projects, and interacting with history at your fingertips. I welcome this project, having read the English translation myself many years ago, but evidently Google was not a wise choice of tech partner. Google's reputation is over-inflated by hype and the success of search a decade ago, while the corporation's key brands are a testimony to imitation and acquisition rather than innovation. Many of the bugs in Google's interface for viewing Dead Sea Scrolls are apparent within the first few minutes of use. The translation lightboxes that appear when a verse is clicked are consistently obscured by the border around the viewing frame, and sometimes the lightboxes don't appear at all when the verse is clicked. For example, see this screenshot taken in Google's own Chrome web browser; thus preempting the excuses for bugs usually cited by Google's vocal and influential communities of apologists.